This PDF 1.5 document has been generated by , and has been sent on pdf-archive.com on 02/07/2015 at 04:13, from IP address 203.117.x.x. The current document download page has been viewed 292 times. File size: 307 KB (31 pages). 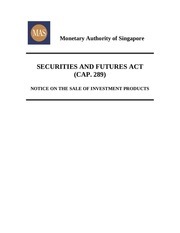 Securities and Futures Act (Cap. 289) [“the Act”]. units of which are Excluded Investment Products. of which are Excluded Investment Products. meaning to the term “transact” as defined in paragraph 4.
not to possess knowledge or experience in derivatives. institution shall provide such advice to the Customer concerned. exempt financial institution, as the case may be. This file has been shared by a user of PDF Archive. Document ID: 00284771.